Jim Kenney Wins Democratic Primary for Mayor. Click here for the story. The Manny Morales campaign has fired back at Councilwoman Maria Quinones-Sanchez, accusing the incumbent of wrongdoing at the polls in the Seventh Councilmanic District. "We have proof that it's actually her intimidating voters and they're walking inside the polling places with T-shirts reading 're-elect Maria Quinones,'" Morales spokesman Jose Giral told Newsworks. "We've forwarded our evidence to the district attorney's office." Quinones-Sanchez earlier told Al Dia News that her campaign had filed an injunction against illegal sample ballots. More than 60 complaints have been reported to the DA's office, according to Newsworks. Nearly half of them are from the Seventh District. We will also be posting more as some of the counts begin to materialize. A voter every five minutes, on average. That's what workers at the poll at Girard Avenue and 3rd Street in Kensington reported late Tuesday afternoon. Turnout was about in line with past local primary elections, they said. As of 5:20 p.m., 128 voters had shown up, poll workers said, adding there were 700 to 800 voters on the rolls. That means that in the first 10 hours of voting, there was an average of about 12 voters an hour. There was a slow trickle of voting activity during our walk-by. Richard Robinson, 63, said he voted for Milton Street, a significant underdog, in the mayoral primary but had not committed to a party or candidate for the general. “One thing I know is that he knows politics,” Robinson said of Street. He said that his priority is education for kids. “Education for children is non-negotiable.” He also wants more recreation centers. Arly Smith-Pearson, 28, a criminal attorney, said she was especially interested in the judicial races on the ballot. “The judge races are important to me,” she said. The judicial race features a slew of candidates who receive comparatively little media attention. The bar association puts out a guide to help voters understand the candidates' qualifications and provide some degree of clarity for voters confused about whom to support. Smith-Pearson said even she wasn't familiar with all the judicial candidates on the ballot. “It is important to have Philly voices on the bench because we want the representation,” she said. For mayor, she said she didn’t feel as strongly about a particular candidate. “Kenney seems to have it in the bag,” she said. Councilwoman Maria Quinones-Sanchez told Al Dia News that her campaign's legal team filed an injunction alleging illegal ballots being used in the Seventh Councilmanic District. Quinones-Sanchez is being challenged by Manny Morales, who initially received the party's endorsement before racist and antigay posts were discovered on his Facebook page. Democratic leaders have since split their support between Morales and Quinones-Sanchez. Quinones-Sanchez told Al Dia that she has witnessed a lot of people with illegal ballots distributed by Latinos United for Political Empowerment and seen videos of cash payments being given to judges of elections. "I said for weeks that someone is going to go to jail after this election," Sanchez said. "It's going to happen." District Attorney spokesman Cameron Kline acknowledged the Election Task Force has received reports of palm cards not properly atttributed in the Seventh District. Overall, he said the DA's Office has received few complaints. Some machines weren't functioning properly in the morning. "All in all, it's been fairly routine," Kline told PhillyVoice. Many media members have labeled the Philadelphia Democratic mayoral primary a snoozefest. The Democratic mayoral primary in Chester — just south on I-95 — has not received the wealth of coverage seen in the Philadelphia contest, but the race has packed plenty of intrigue. It might result in an incumbent falling just four years after he helped spearhead a Democratic revival in a city long dominated by Republicans. Chester Mayor John Linder faces State Rep. Thaddeus Kirkland in a battle formed after years of intra-party fighting. Linder and his all-Democratic city council began feuding less than a year after he took office. Much of the debate has focused on Police Commissioner Joseph Bail, whom council unsuccessfully sought to oust in 2012. RELATED STORY: It's Primary Day in Pa., and polls are open till 8 p.m.
Linder, who had Kirkland's backing when Democrats took full control of the city government in 2011, lost the support of his fellow council members and the city's Democratic party. That brought a challenge from Kirkland, a 12-term state lawmaker and arguably the most influential Democrat in the city. Adding to the intrigue: the winner will square off against former Republican Mayor Wendell Butler, who lost to Linder in 2011. For more on the race, check out these stories by the Delaware County Daily Times and the Philadelphia Inquirer. 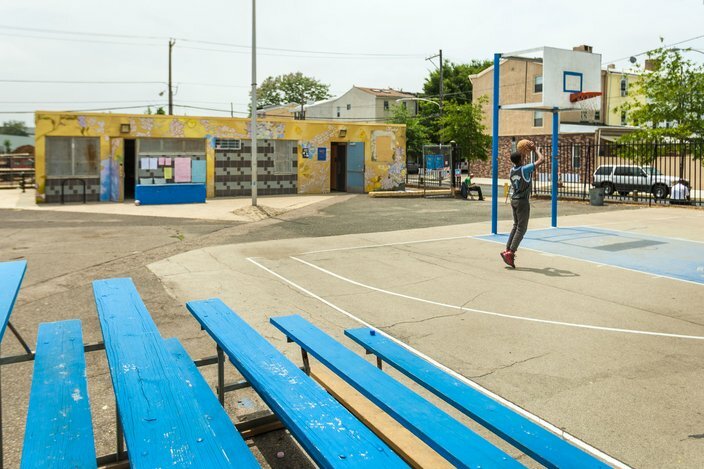 David Hardy, the founder and CEO of Boys' Latin of Philadelphia charter school, took aim at education advocate Helen Gym in an email that is circulating today. Gym, an outspoken supporter of public schools, is seeking an at-large seat on City Council. Hardy writes, "Don't vote for Helen Gym .... She hates us." Hardy took a beating from commenters on Twitter, many of whom took issue with an educator politicking. So far, predictions that this would be a low turnout election have proven true. Though he cautions it's still too early to tell, Committee of 70 CEO David Thornburgh said Philadelphia voting is looking "a little thin." When PhillyVoice caught up with Thornburgh he had just finished visiting 10 polling places across the city and found "the poll workers in many places seem to outnumber the voters." A lunch time visit at a precinct on the corner of Hancock and Master streets, near Kensington, proved the point. Only a handful of voters trickled into the polling station during the lunch hour. Jackie Way, 30, said she has lived in the neighborhood her whole life. She wouldn’t say who she voted for - that was private - but she said there was a need for change. Stewart Olshevski, 22, said he had lived in the neighborhood for about a year. He cared about education and the relationship residents had with police. While he didn’t directly take part in some of the recent protests against police misconduct, he said that some of his friends had. He voted for Anthony Williams because he thought the former state senator could best address police issues. Just when you think you've done your civic duty by voting for mayor, council and judges, you're confronted with four ballot questions written in the usual vexing bureaucratic fog-machine language. Coming to the rescue: the watchdog group, Committee of 70, which outlines the ballot questions, including one on the future of the School Reform Commission and one on the formation of a committee devoted to improving the lives of women, in plain language. And we have a winner...at least in the race for which mayoral candidate got to the voting booth first to cast a ballot. CBSPhilly is reporting former judge Nelson Diaz in Chestnut Hill and State Senator Anthony Hardy Williams in Cobbs Creek were the first to the polls, while former Philadelphia District Attorney Lynne Abraham and Republican candidate Melissa Murray Bailey arrived within minutes of each other at the Society Hill Dance Academy. STILL TRYING TO DECIDE WHO TO VOTE FOR? Despite all the debates, endorsements and commercials, are you still uncertain who to vote for mayor in Tuesday's Democratic primary? Philadelphia voters have until 8 p.m. to cast their vote and there are plenty of resources on the Internet to guide voters on which candidate's views most closely mirror their own, from candidate Q&As, to position and priority ranking and expert commentary. The six mayoral candidates fighting for a spot in the general election are Democrats Lynne Abraham, Nelson Diaz, Jim Kenney, Doug Oliver, Milton Street Jr. and Anthony Williams. On the Republican side, Melissa Murray Bailey is uncontested. 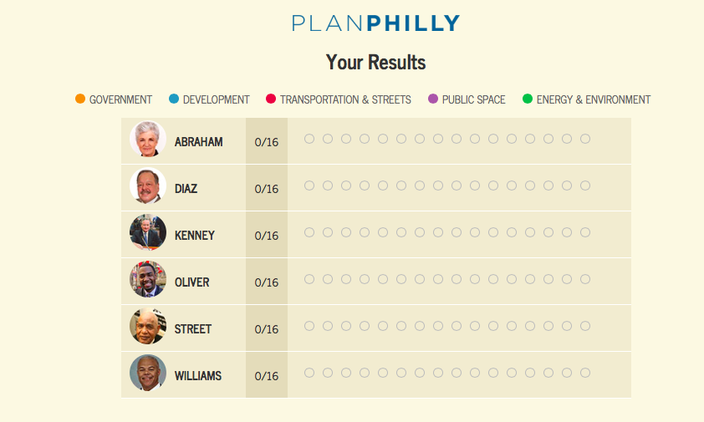 On the topic of urban planning, PlanPhilly has created an interactive Mayoral Matchmaker tool by distilling the candidates’ positions and priorities on a narrow set of 16 planning issues. Users can use the tool to browse the candidates’ views and opinions, and select the responses he or she most agrees with to see which candidate might be a best match in terms of urban planning.